Alicia Latham Schwark, MD, a medical genetics fellow at Memorial Sloan Kettering Cancer Center and colleagues, used MSK-IMPACT, which incorporates MSI assessment using a bioinformatics tool called an MSI sensor. The tool generates a report that designates a score of ≥10 as MSI-H, a score between 3 and 10 as MSI-indeterminate (MSI-I), and scores less than 3 as microsatellite stable (MSS). The researchers demonstrated that among the samples, which spanned more than 50 cancer types, 50% of patients (33/66) with LS had MSI-H tumors that were not previously associated with the syndrome. Findings were reported during the 2018 American Society of Clinical Oncology Annual Meeting, held June 1-5 in Chicago, Illinois. The presence of MSI indicates a defect in the DNA mismatch repair system. It has been established that this finding is characteristic of LS-associated cancers, primarily colorectal and endometrial. Testing for MSI is routinely performed in all colorectal and endometrial cancers as an initial screening for LS. However, the prevalence of LS in other cancers is unknown. Five mismatch repair genes were assessed: MLH1, MSH2, MSH6, PMS2 (single nucleotide variations and deletion [del]/ duplication), and EPCAM (del only). In patients with LS with MSI-H and MSI-I tumors, IHC staining for MMR protein expression was performed. Breast cancer made up the largest group (16%) of tumor types, followed by lung cancer (13%). 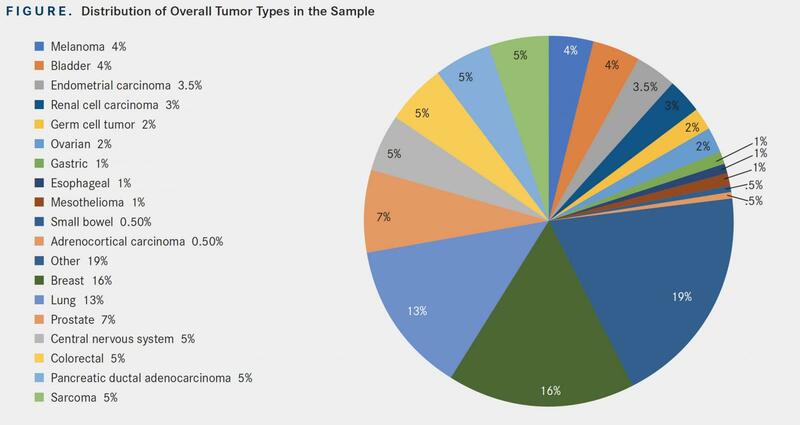 Overall, colorectal and endometrial cancer tumors made up 5% and 3.5% of the group, respectively (FIGURE). Because of its gene type, Schwark said that when LS is not associated with cancer, it is often hard to detect. When categorizing tumors by MSI status, the distributions change said Schwark. 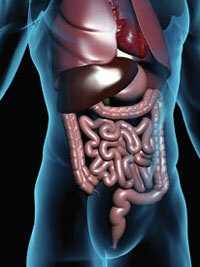 “Small bowel cancer had the highest rate of MSI-H tumors at 25%. This was followed by endometrial, colorectal, and gastric cancers, which have been previously associated with LS. When including the indeterminate prevalence, adrenocortical had the highest rate at over 40%,” said Schwark. Across the 3 groups, the prevalence of LS in patients with MSI-H tumors was 16.3%, the MSI-I group had a 1.9% LS prevalence, and the prevalence of LS in patients in the MSS group was 0.3%. When reviewing the distribution of germline mismatched repair mutations by gene and MSI status, the investigators reported that the majority of germline mutations in the high and indeterminate groups were found in MLH1 and MSH2. The majority of mutations in the MSS group were in MSH6 and PMS2 (P <.001). “This is notable, as it has been previously demonstrated that MSH6 and PMS2 are lower penetrance genes that are found more commonly in the general population, suggesting that these may be incidental findings,” said Schwark. “Patients with LS who had MSI high or indeterminate tumors, their tumors were likely caused by their LS. Those that were found to have MSS tumors, these tumors were likely not caused by their LS,” said Schwark. Schwark added that nearly 40% of patients with LS who have MSI-H noncolorectal or nonendometrial tumors did not meet clinical criteria for genetic testing. This suggests that these types of tumors, regardless of cancer type, should prompt LS testing. The researchers concluded that overall prevalence of LS varied significantly across all 3 groups, with 16.3% of MSI-H tumors being found to have LS. Half of the patients with LS, with either high or indeterminate tumors, had cancers other than colorectal or endometrial. Concordant IHC indicated that their cancer was caused by their LS. Moreover, patients with other cancers were less likely to meet clinical testing criteria.